The 2017 Thomas Devlin Fund Award Winners with actress Karen Hassan who presented the awards - Left to right Rebecca Doherty, Karen Hassan, Ian John Brown, Jason Mc Auley, Conall Mc Hugh and Frasier Hickland. A talented Londonderry musician has been awarded a bursary to study in England through the Thomas Devlin Fund. Rebecca Doherty is one of seven young people have been granted awards this year to enable them to participate in master classes and academic studies in the field of music. She received her Music award alongside the other six during a celebration event at the MAC in Belfast recently. Rebecca now plans to use her bursary to attend the Woodhouse Advanced Recorder Course in Uley, Gloucestershire. This course provides specialist training in Early Music, and in Recorder techniques which she hopes will advance her skills in playing the instrument. Rebecca is described as “an extremely talented musician and teacher in her fields of expertise; Recorder, Piano, Violin, Flute and Singing”. She was was runner up in NI Young Musician, and is lead soprano in the Ulster Youth Chamber Choir and soprano in Ulster Youth Choir. 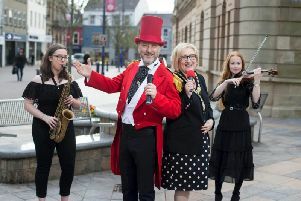 Each year the Thomas Devlin Awards, managed by the Community Foundation for Northern Ireland, celebrate and support young local talent in the Arts and music. In 2017, the awards focussed solely on music and seven young people are being recognised for their achievements and dedication to the arts. Thomas’ parents Penny Holloway and Jim Devlin said: “Music and the arts form an important part of the lives of many young people and are often used by them as a means of expression. The Thomas Devlin Fund grantees will use their awards to study music throughout Europe. Andrew McCracken Chief Executive of the Community Foundation said: “The Community Foundation is proud to manage the Thomas Devlin Fund on behalf of Thomas’ parents Penny and Jim.